I was in Toronto this past weekend to see Revealing the Early Renaissance at the AGO. * If you have been around here for a while you'll know that there's nothing I like better than a good hotel - "good" in this context meaning either very old or very new - but I must admit that there is also a place in my heart for the faceless mediocrity and "luxury" of large hotel chains. Anyway. This time around I had the pleasure of staying at the Gladstone Hotel. The Gladstone started off life as a Victorian inn and has had a long and chequered history. In its current form it is a boutique hotel and each of its 37 rooms has been designed and decorated by a different artist. There are gallery spaces that feature rotating exhibits on each floor. It's like sleeping in the middle of an installation and it is wonderful. The aforementioned gallery spaces - the common rooms on each floor - are all pleasingly white walls broken up by a series of identical black-lacquered doors. The space has a delicious nowhere-ness to it - like it only exists to move you on to the next place. Like something out of a C.S. Lewis novel you're very aware that you're about to enter an entirely new and fantastic world. Fate had clearly stuck a finger in the psychic soup that night because when I opened the door and flipped on the lights I saw this: I often muse (out loud) about Science one day offering me a door - here, in my own home - with Central London on the other side of it. Well, it seemed that I had found such a door - and one that opened up onto a Victorian parlour to boot. Not quite though, because despite the faded photographs and heavy decor I was merely in Room 402 - Rayne Baron's** Victorian-inspired room called "Echame Flores." What an absolute delight - and terror - for me. I have been slightly…uneasy around Victorian antiques as of late and this is probably because I am currently reading The Arsenic Century: How Victorian Britain was poisoned at home, work and play. Naturally I've been looking at all Victorian items askance since. I am sure I am just being silly since I don't own very many antique Victorian pieces (yet) and I am not in the habit of licking the ones that I do. But still - in the golden glow of the (anachronistically) electric fixtures - the way that those deep green velvet curtains catch the light…well. I never did trust a curtain. *If you're going to the AGO you simply MUST SEE Patti Smith: Camera Solo. I saw it this past summer in Detroit and it completely blew me away. 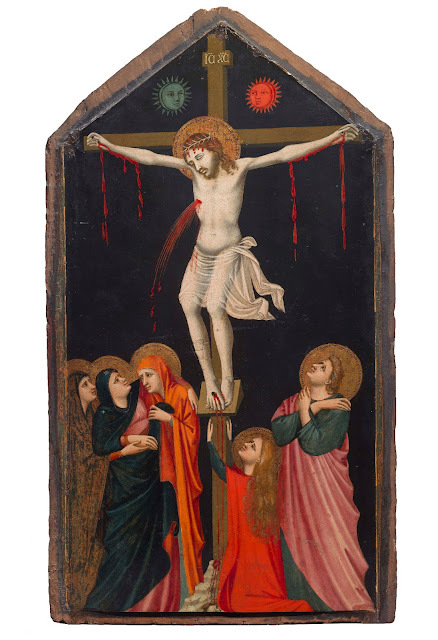 If you fancy a bit of ring structure, check out this AGO blog post where Patti Smith herself tours the Revealing the Early Renaissance exhibit and offers her insights on both St. Francis and the mystic-influenced work of Pacino di Bonaguida. **You might be more familiar with Rayne Baron's other incarnation which is that of the incomparable Ladyfag. I knew I had heard the name somewhere before and I was delighted to learn that the room was hers. Cool! I'll be following all those links, thanks for sharing! April 24, 2013 at 1:19 p.m. I still haven't started any of your mitten patterns but it is one of my main goals in 2013. Almost there. Hope you enjoyed your visit to Toronto. Sorry I couldn't buy you a coffee! April 25, 2013 at 7:51 a.m.
Wow! Some great piece of excellent art works. As an artist i expect good art works as you shown this post. January 29, 2014 at 9:42 a.m.